In three years, Professor Eduardo Pedro Fracassi has journeyed from being inactive on climate change progress to making a major impact with Climate Interactive’s World Climate Exercise. He’s gone from Climate Student to Climate Star. After seeing a presentation of Climate Interactive’s work, Eduardo co-facilitated with fellow professor Fabian Szulanski 17 World Climate Exercise workshops, proposed a Climate Engineering course at the Buenos Aires Institute of Technology (ITBA), inspired a group of students to convert their recycling group into a climate change mitigation group, worked with Gloria Perez Salazar, President of the Latam Systems Dynamics Society Chapter and 15 volunteers to translate the World Climate briefing materials into Spanish, and built a coalition of 140 people working to address climate change. But just three years earlier he had focused all his efforts on science and systems thinking, with climate no more than an issue he cared about. 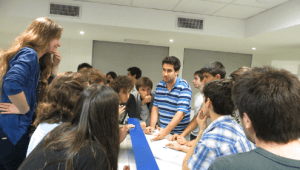 Eduardo teaches a systems thinking course at the University of Business and Social Sciences (UCES) in Bueno Aires, Argentina. 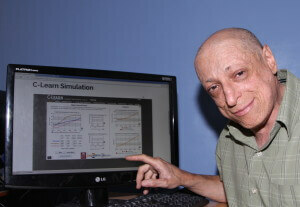 In 2012, he attended his local System Dynamics Society’s presentation of Climate Interactive’s C-Learn and C-ROADS tool. 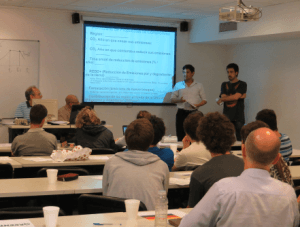 The presentation, given by Climate Interactive team member and MIT Professor John Sterman, taught Eduardo about the consequences of global climate change in his area. At first, Eduardo didn’t know much about global warming, and he had no funding for the Initiative. 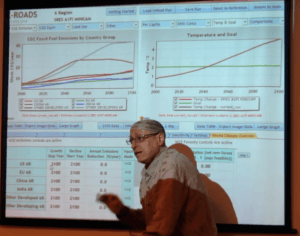 But through Professor Sterman’s speech, he found Climate Interactive’s World Climate Exercise. I had the chance to talk with Eduardo (he Skyped from Buenos Aires, Argentina) about his work…. It’s a wonderful teaching tool because it synthesizes the whole act of climate change. It’s a tool that works and it’s easy to use. The World Climate Exercise is all about people doing things to create change, and people need goals to make change. People want to see the changes in the simulations; they want to know if we are the safe zone. Why do you keep running the World Climate Exercise? It really shows the impacts of climate change and setting goals to mitigate climate change. There is a paradigm shift with this tool and people realize that their actions have consequences. Students get to play the game, and they enjoy the game. It’s fun and it really engages people. I’ve seen students continue to play the game to the point where I’ve had to push them out of the building to get them to stop. How do you feel leading up to hosting World Climate? How do you feel after? I hope this exercise helps create an awareness about this issue we are facing. I hope and pray the exercise will lead to action. After running the exercise in Costa Rica, a man from Colombia asked me to travel to that country to administer the game. And, a man from Brazil wants to translate the exercise to Portuguese. This tool is a great multiplier – a viral engine. This tool helped me understand what is happening with climate change and enabled me to contribute. I want to leave something for humanity. I see purpose in what I do. What is your favorite moment running the World Climate Exercise? My favorite moment is when participants ask if they can run the exercise in other places. I also enjoy when people realize that they should start doing things differently to combat climate change. Students want to learn how to negotiate and they want to learn how to resolve these climate change issues. People need an explanation afterwards to find out what they need to do to live a happy life. They remain paralyzed if they don’t know what to do. They should be shown all the ways to avoid the disaster. No, but they are affected. They are changed after the exercise. Students want the future – a safe place to live. If you decide to translate them into Dutch, we would be happy to share them on the website, like we have done with Eduardo’s Spanish translations and those from others.